Retail Price: $645 single DVD or USB flash drive (Read&Write GOLD MOBILE); also available in unlimited site licenses; concurrent site licenses, and volume license discounts. Teachers (or parents of students) at a school that has a Read&Write GOLD Site License can purchase a single user copy for $295. For pricing or for information on upgrading a current Read&Write product, call Texthelp at (888) 248-0652 or email u.s.info@texthelp.com. Section 504 of the Rehabilitation Act requires American schools to provide equal access to instructional content for all students. To comply with the law and meet the needs of every learner regardless of ability, teachers often make their lessons available in multiple formats, integrating audio, video and graphical enhancements for flexible access and individual learning support (http://www.udlcenter.org/aboutudl/udlguidelines/principle1). While Macintosh and Windows operating systems come with many built-in technologies to assist users with physical, vision, and reading disabilities, these tools have limitations. To bridge the gap, software developers have released products providing additional support. Texthelp Systems, in business since 1996, is one such company. 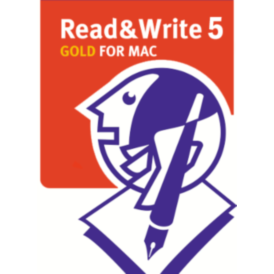 Its latest release of Read&Write 5 GOLD for Mac (R&W Gold 5) provides robust text-to-speech designed to assist children and adults who struggle with reading and writing. More than just a text-to-speech reader, the floating toolbar (see below) in R&W Gold 5 works well with other popular Macintosh applications, including Microsoft Office, Apple Pages, Mozilla Firefox, Google Chrome, Apple Safari, Acrobat PDF, and Apple Calculator. Its 26 default buttons provide tools for reading (Screenshot Reader, Safari Web Highlighting, PDF Aloud, Dictionary, Picture Dictionary, SpeechMaker, and Translator), writing (Spelling and Verb Checkers, Word Prediction, Sounds Like, and Confusable Words), research and study (Fact Finder, Fact Mapper, Highlighters, and Vocabulary List Builder). Students who require literacy-building assistance for reading and writing will appreciate this program’s robust text-to-speech functionality. They can use the program’s default high quality voices for read aloud or the voices built-into the Mac OS. When used together with the program’s Scan tool, the application can easily read aloud a scanned worksheet, teacher’s notes or whatever is placed on the scanner bed. If, when surfing the Web, users encounter a Flash-based page with text that cannot be read aloud with the application’s built-in text-to-speech tool, they can use the R&W Gold Screenshot Reader to highlight the relevant portion, then let the tool convert the selection into readable text. Converted words are highlighted on screen as R&W 5 Gold reads them aloud. The latest version of R&W Gold for Mac has several enhancements and new features. One important new tool is the Picture Dictionary (see below), offering visual references to support comprehension and independent learning. For example, when youngsters conduct Web research and encounter a difficult word, they can click the Picture Dictionary button on the R&W Gold toolbar, then select that word on the Web page and have Picture Dictionary display a contextual image, with an option to call up the program’s Dictionary for additional support. The 11,000 images and symbols (covering more than 40,000 words) in this Picture Dictionary Texthelp come from Widgit, a company known for its popular ‘WritingwithSymbols’ software. (http://www.widgit.com/). R&W Gold’s Verb Checker, also new to version 5, supports literacy building, while helping users determine if they are using the correct tense of a chosen verb. Selections can be read aloud, thereby promoting independent work. R&W Gold 5 for Mac offers access from a floating toolbar or in an Application View window. When using the floating toolbar, helpful text-based tooltips pop-up if you rest the pointer on a toolbar button. The Application View works best for Copy/Paste operations. The program automatically switches from Toolbar view to Application view to Paste text into the Application View window when you Copy text from a Firefox Web page or an open PDF document. Given the program’s many built-in applets and settings, it will take time to learn how best to use all those features or personalize the settings for use with a particular student. For example, you can choose a voice, determine whether the program highlights each word, sentence or paragraph when reading text aloud in a Microsoft Word or Apple Pages document, decide if the Scan option scans to PDF, HTML, Microsoft Word, Apple Pages or Read&Write Gold, pick the buttons to put on the toolbar, select colors to use for Speech, spelling errors, homophones, and much more. Thankfully, Texthelp provides Video Tours for many program features. These are accessible from the program’s Help menu. Additionally, built-in Help files can be called up as you work. Also, when you install the program, there is an option to access and save a comprehensive Training Guide. One feature I would like to see added to the next release of the program is an easy way to search for a word or phrase while using the program’s built-in Help file. Currently, the Mac Help file has no Search options. If you try to search for text from the program’s Help menu before you call up the Help file, you get Help for Macintosh features, not R&W Gold. In Toolbar view you can continue working in your favorite application and call R&W Gold into play from the floating toolbar as needed, while Application View automatically displays text copied from a Web browser so that it can be read aloud, checked for spelling errors, and more. Users should also explore customizing program features through the program’s Preferences pane. Mac users will appreciate how the application integrates tightly with popular applications such as Pages, Safari, MS Word, and Adobe Reader. If you turn on Safari Web Highlighting in the Speech menu, you only have to rest the mouse pointer over text in the Safari browser to have that text read aloud. R&W Gold 5 for Mac is highly suitable for use both in and out of the classroom. Its versatile toolkit promotes student-centered, self-paced learning independence, because it reads aloud virtually any text that displays on screen. It also offers Dictionary and visual learning support for struggling readers or English Language Learners, plus read-aloud word prediction (complete with optional Dictionary definitions) to help writers with sentence construction. Read&Write GOLD MOBILE, the version available on USB, requires no installation, allowing schools to loan out the USB drive to teachers or students who wish to try out or use the application at home. A Concurrent Site License option lets you install Read&Write GOLD on all computers, but limits the number of simultaneous school or home users to the number of “seats” purchased. The user interface in both Macintosh and Windows versions is very similar, enabling students to use the product on any computer regardless of platform. R&W Gold is often marketed as a more affordable alternative to Kurzweil 3000. Those schools contemplating a switch will appreciate that Texthelp offers a free Web-based service, enabling users to upload existing KES documents for conversion to PDF http://converter.texthelp.com/. Once converted R&W Gold 5 for Mac will read aloud that PDF file using Acrobat’s PDFAloud3 function. Read&Write Gold pricing for Macintosh and Windows versions are identical, but their feature sets are not. For example, the Mac version has a Fact Finder research tool that works with popular search engines, but it cannot capture text and graphics from any application like its Windows counterpart. Similarly, the Mac version lacks a Pronunciation Tutor, is unable to speak Dragon Recognized Text and has no Speech Input facility allowing users to create documents by talking into a microphone. Additionally, while the Windows version lets users group toolbar buttons by functions such as reading, writing, research, or study skills, toolbar customization in the Mac version must be done through the program’s Settings. Even though the Macintosh version Read & Write Gold is not as extensive as its Window’s counterpart, it’s still quite impressive. Numerous applets work together to provide reading, writing, and research support regardless of variations in student ability, skill, reading level, learning style, native language, race, and cultural background. The ability to convert and read-aloud text embedded on a Flash-based Web is itself worth the price of admission. A 30-day free demo (http://www.texthelp.com/North-America/our-products/readwrite) is available for downloading. Floating Toolbar provides access to the application toolkit while users work in their everyday applications, including Microsoft Word, Pages, Safari, and Acrobat Reader/Pro. Built-in tools read aloud text that is typically inaccessible (e.g., Flash). Flexible licensing options to accommodate a variety of installation needs. About the Author: Carol S. Holzberg, PhD, cholzberg@gmail.com (Shutesbury, Massachusetts) is an educational technology specialist and anthropologist who writes for several publications and works as the District Technology Coordinator for the Greenfield Public Schools (Greenfield, Massachusetts). She teaches in the Licensure program at the Collaborative for Educational Services (Northampton, MA) and the School of Education at Capella University. As an experienced online instructor, course designer, and program director, Carol is responsible for developing and offering training programs and support for faculty and staff on technology for teaching and learning. Send comments or queries via email to: cholzberg@gmail.com.